“To live better with fire, we need to adapt to fire” is a thought paradigm fire community leaders are adopting to address their wildland urban interface issues. Western wildfires in recent years demonstrate the urgency in which we need to adapt to fire in order to be more resilient in the communities we call home. This article describes what may be called the modern wildfire situation with some of the forces driving wildfire conditions today, resources, and a community example planners can use to participate in wildfire adaptation in their communities. While there are numerous factors, the conditions for today’s wildfire situation can be largely attributed to three: 1.) 20th century fire suppression policies; 2.) the increase of human settlements in the wildland urban interface; and 3.) the global warming trend since the latter part of the 20th century. Prior to the 20th Century, wildfire was an essential element in nearly all states and woodlands in the Western states. Wildfire events naturally suppressed undergrowth and downed fuels. Twentieth-century forest management transitioned to a fire suppression policy (in response to uncontrollable wildfire events during the late 19th and early 20th centuries). This policy seemed quite successful until the great 1988 Yellowstone Fires, when wildfire consumed 793,880 acres of the national park, largely attributed to the unnatural buildup of forest fuel (an unintended consequence of fire suppression). Many more people are living in the wildland urban interface of Western forests and woodlands. The realization that these communities were threatened by uncontrollable wildfire became evident as well, particularly with the 1990’s wildfires in Southern California when thousands of homes were destroyed, including the 1991 Tunnel/Oakland Fire and the 1993 Laguna Hills and Old Topanga Fires. Since the latter part of the 20th century, temperatures are increasing on earth. Warmer temperatures increase evaporation, which has created drier forest conditions in an already arid West. To estimate wildfire behavior, firefighters use the wildfire behavior triangle which considers the relationships between fuels, weather and topography. Thus, modern conditions are ripe for the wildfire events we have experienced to date. Large amounts of dry fuel to burn due to historical fire suppression, warmer temperatures, and homes and communities placed directly in the wildland urban interface become particularly at risk. Dr. Paul Hessburg, Research Ecologist with Pacific Northwest Research Station, U.S. Forest Service has deemed that “we live in the Era of Megafires,” defined as wildfires over 100,000 acres in size. Since 1997 to 2017, the National Interagency Fire Center (NIFC) lists 189 US wildland megafires, ranging from 100,000 to 1,305,592 acres. In contrast, NIFC’s list of Historically Significant Wildland Fires records only nine fires over 100,000 acres since the Cloquet-Moose Lake Fire in 1918 to 1996. Keeping the wildfire behavior triangle in mind, it is important to remember both fuels and weather are key components of fire behavior. As such, it would be wrong to fault the modern wildfire situation on global warming alone, just as it would be wrong to discount global warming, or climate change, all together. Climate change is the acceleration of the earth’s hydrologic process caused by global warming. Let’s break that down: Acceleration is the ongoing upward trend of extreme weather phenomena occurrence, both in frequency and intensity. These include droughts, heat waves, record-breaking temperatures, milder winters, reduced snowpack, dust storms, micro-bursts and flooding. These are all mechanisms of earth’s hydrologic process, or water cycle in the transfer and storage of moisture. The increase of these events in recent decades is documented and observable. Global warming has to do with the earth’s greenhouse effect, in which a set of well-mixed and long-lived atmospheric gases, such as carbon dioxide and methane, help trap a portion the sun’s heat in the troposphere (within eight miles of sea level). These greenhouse gases make for livable conditions on earth. However, the more of these gases in the atmosphere, the more the earth’s temperature increases. Just as the earth has a water cycle, it has a carbon cycle. Energy made from carbon-based, mined materials such as coal, oil and natural gas, produces atmospheric carbon dioxide (CO2) as a byproduct. “Since 1751, approximately 374 billion metric tons of carbon have been released to the atmosphere from the consumption of fossil fuels and cement production. 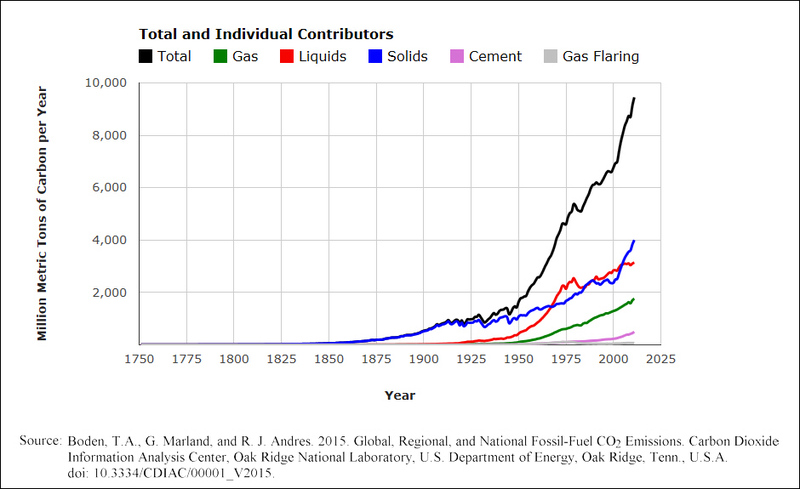 Half of these fossil-fuel CO2 emissions have occurred since the mid-1980s.” In 1958, CO2 concentration was measured at 315 parts per million (ppm) at the Mauna Loa Observatory and was increasing at a rate of 0.7 ppm per year. Today, it is over 405 ppm and increasing at up to 3ppm per year. That is an increase of over 25 percent in 60 years. Unfortunately, this upward trend has no end in sight. Indeed, much has been accomplished to address this wildfire situation in many communities in recent years. The Greater Flagstaff Forests Partnership (GFFP) in Flagstaff, AZ, for example, is a community based collaborative organization supporting cooperative efforts to examine and demonstrate proactive approaches to forest restoration and community protection. For more than 20 years GFFP has helped lead a shift in public understanding and support for proactive forest management. The success of these efforts became evident when the community of Flagstaff transformed tragedy to opportunity in northern Arizona. The 2010 Schultz Fire burned more than 15,000 acres in the iconic San Francisco Peaks and caused a flash flood that killed a 12-year-old girl. Repeated post-fire flooding and erosion damaged many homes and a major municipal water pipeline. A detailed report about the Schultz Fire highlights the stark reality of how severe post-fire impacts continue to effect communities long after the smoke has cleared. While Schultz Fire suppression costs totaled approximately $14 million, the study conservatively estimates a total economic impact between $133 and $147 million. It reinforced that while wildfire can destroy homes and forests, the post-fire impacts can be even more devastating to the community and last for decades. Recently the community and political support came together under the GFFP to find solutions to wildfire mitigation. Memories of the devastating Schultz Fire catalyzed public support to create the Flagstaff Watershed Protection Project (FWPP). The project is funded by a $10 million municipal bond, which was approved by 74 percent of the voters in 2012. The FWPP is a collaborative effort including the City of Flagstaff, Coconino National Forest, Arizona State Lands Department, Arizona Department of Forestry and Fire Management and Coconino County. The bond funds are used to implement wildfire risk reduction measures and mitigate post-fire flooding impacts on over 13,500 acres, the majority of which is outside city jurisdiction on federal land. GFFP is contracted to provide the education and outreach. The project helped catalyze completion of NEPA documentation by the Forest Service and roadbuilding to assist treatments. To date, well over 50,000 acres have been treated (by the USDA Forest Service and other partners) within and immediately around Flagstaff. Using a cost-share program, $1.6 million has been generated and distributed to property owners to treat more than 4,000 acres of private land (M. Brehl, GFFP President, personal communication, October 2018). Planners need to engage with their local firefighting community to encourage an “all-hands” approach to wildland fire safety. All members and property owners of a fire-prone community need to recognize they have a role in the solution and are encouraged to participate. As more community members come to this realization, our communities can continue to address wildland urban interface issues effectively, to the point where forest fires can happen without threat to adjacent communities, and both forests and communities are resilient now and into the future. Christopher Jones is a county extension agent at the University of Arizona in Gila County. He conducts educational Extension programs in horticulture and natural resources, including wildfire mitigation, climate science, watershed management and forest health. Jones earned degrees in Forestry (BS) and Renewable Natural Resources (MS).